Where's Johnny? AWOL, as usual. The Media picks our candidates! (2) High salaries paid to McCain staffers from Reform Institute funds – including Juan Hernandez. On Super Tuesday 14.6 million voters took part in the Democratic races, compared to 8.3 million Republicans. The Party is on denial of the harm caused by President Bush’s refusal to secure our borders and enforce immigration law. Bush’s approval rating in abysmal. Millions of registered Republicans are showing their displeasure by staying home. McCain stands for amnesty and more of the same. Yet, the Reform Institute still employs the McCain campaign's Hispanic outreach director, Juan Hernandez, as a senior fellow of its Comprehensive Immigration Reform Initiative. As WND reported, Hernandez serves as a non-paid volunteer for the McCain campaign (The salary comes instead from the Reform Institute and Soros’s money). A dual Mexican-U.S. citizen, he was a member of former President Vicente Fox's cabinet, representing an estimate 24 million Mexicans living abroad. Hernandez, with a "Mexico first" message, has argued aggressively against building a fence on the Mexican border, insisting the frontier needed to remain wide open so illegal immigrants could easily enter the U.S. The July 6, 2001, homepage of the Reform Institute archived on the Internet lists founder McCain as chairman of the group's advisory committee. Prominent senior officials on the McCain 2008 presidential campaign staff found generously paid positions at the Reform Institute following the senator's unsuccessful run for the White House in 2000. Rick Davis, McCain's current campaign manager, was paid $110,000 a year by the Reform Institute for a consulting position, according to the group's 2003 Form 990 filing with the IRS. In 2004, Davis advanced to the position of Reform Institute president, with an annual salary of $120,000, according to the group's 2004 Form 990. Carla Eudy, a senior advisor on McCain's 2008 presidential campaign who until recently headed fundraising, was paid $177,885 in 2005 to serve as the Reform Institute's secretary-treasurer. Other McCain presidential campaign staffers who have found employment at the Reform Institute include Trevor Potter, McCain's 2000 legal counsel, and Crystal Benton, the senator's former press secretary, who served as institute's communications director in 2005 for an annual salary of $52,083. 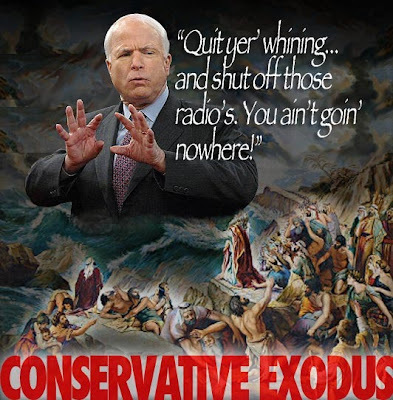 The Reform Institute regularly has supported McCain in various legislative efforts, including on campaign finance reform, global warming and "comprehensive immigration reform," all efforts widely opposed by many in the party's conservative base. Arianna Huffington, syndicated columnist and creator of the HuffingtonPost.com, has served on the Reform Institute's advisory committee since the group's inception. Subsequently, David Horowitz's DiscoverTheNetworks.org website and Michelle Malkin's blog gave renewed attention to the Reform Institute's funding ties. Our Monday post highlighting a Cuban flag with the super-imposed face of psychotic Marxist Che Guevara hanging in Barack Obama’s Houston HQ’s has caused quite a kerfuffle, which we are happy to inflame further with today’s update. .........the dumbass who hung a flag of psychotic Marxist Che Guevara in Barack Obama’s Houston headquarters is almost certainly a Ms. Maria Isabel. How do we know this? First a bit of video triangulation. Here’s the report on the HQ’s opening from FOX 26 on 2/6/08; note the woman with long brown hair & thick-framed glasses shouting “Barack Obama, woo-hoo!”; woman not named in this report. Turns out that the above-mentioned WooHooer was actually profiled by FOX 26 in an earlier report on 2/3/08, where she is clearly identified as Maria Isabel, and–incredibly–is even shown distributing Obama literature with that same damn Che Guevara flag! Want more? Hey, it’s circumstantial, but we got it! LST’s intrepid Managing Editor Matt Bramanti swung by late Tuesday afternoon, where he spotted a full-sized Stars & Stripes 100% Gen-u-wine AMERICAN flag proudly flying from Isabel’s apartment… along with a uniformed Houston Police Department officer stationed outside, no doubt to (successfully) intimidate intrepid right-wing bloggers from engaging in Citizen Journalism and asking the Tough Questions of unexpectedly Overexposed Moonbats.